never has a movie so lived up to its name. DUMBO. I can't say I was expecting Disney to release a film criticizing themselves, but colour me impressed. Were it not for the paper thin character motivations and the "acting" of Eva Green, Colin Farrell, and two kids who should never be cast in anything else, Dumbo is actually surprisingly refreshing. Burton's thick expressionist art direction looks really good here if you like that sort of thing, the Dumbo animation feels real, and some of the performances and beats ring triumphant. Unfortunately, it loses steam once Michael Keaton shows up to be the bad guy because movies need bad guys. The characters are all really thin charicatures, and the film suffers for it. It picks up the pace about halfway through and is occasionally pretty enjoyable, but like other live action Disney attempts this isn't very memorable. If I hadn't known Tim Burton directed this, I wouldn't have noticed. That man is just all out of Tim Burton. Its not perfect but it is a solid family film. This movie really struggled to keep me interested, with its repetitive scenes and an incredibly boring story. The characters motivations hardly make any sense, and the CGI was not great. Far better than I had feared, and perhaps the best Tim Burton film in over a decade. Had some real Disney magic in it’s first act, but the script had some serious issues later on. Kudos for making an entirely different film than the original, and it could have been really solid with only a few tweaks. Visually stunning and great to see Danny DeVito having a blast, but also a little too bleak for the younger crowd. Unlike, for instance, Disney’s recent remake of Beauty and the Beast, Tim Burton’s Dumbo rejects the notion of a beat-for-beat remake, instead keeping the skeleton of the 1941 original’s premise (big-eared flying circus elephant is separated from its mother) and building its own movie around it, nudging aside everything else from its predecessor. Unfortunately, Burton fails to find anything particularly interesting to put in its place. It's surprising to see a live action remake of an iconic animated film, in a series of other live action remakes of iconic animated films, have such an anti-idolatry message. But it works, to some extent. I just found the whole experience kind of forgettable, which is a shame. I do love Danny DeVito and Michael Keaton, who both clearly had a ton of fun. And it's neat that they found a way to do the Pink Elephants scene without getting the lead drunk. It's a cute movie that's worth a watch. The 2019 Dumbo remake has no heart or soul in it whatsoever. When you spend more time on the side characters than Dumbo himself, you're making a big mistake. Why does Tim Burton completely derail the second half of the movie with such bullcrap and have Michael Keaton play a terrible villain? It's all dragged down with such mediocrity and lack of emotion. 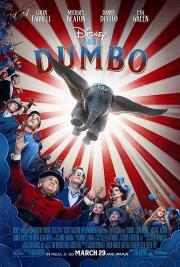 Most of this Dumbo movie feels insincere, and the original still gets me every time. Disney failed thinking this would replace the original! Too many characters, not nearly enough crows, not enough Dumbo, and practically nothing to laugh about. Still, it’s better than expected and surprisingly coherent on its own melancholy Burton/Disney terms.